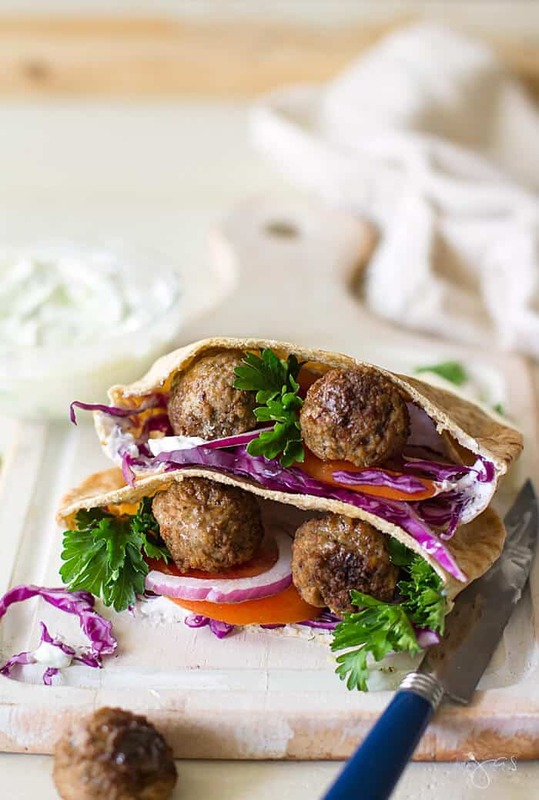 A twist on gyros, this Greek lamb meatball pita sandwich is the fast version of their favorite street food. Flavorful and delicious, these meatballs are easy to make and freeze well too, the perfect solution for a quick and satisfying dinner your family will love! This Greek lamb meatball recipe is also great with beef, chicken or turkey. They are wonderful beyond this pita sandwich: pass them around at a party, pile them over your favorite pilaf or over spaghetti! 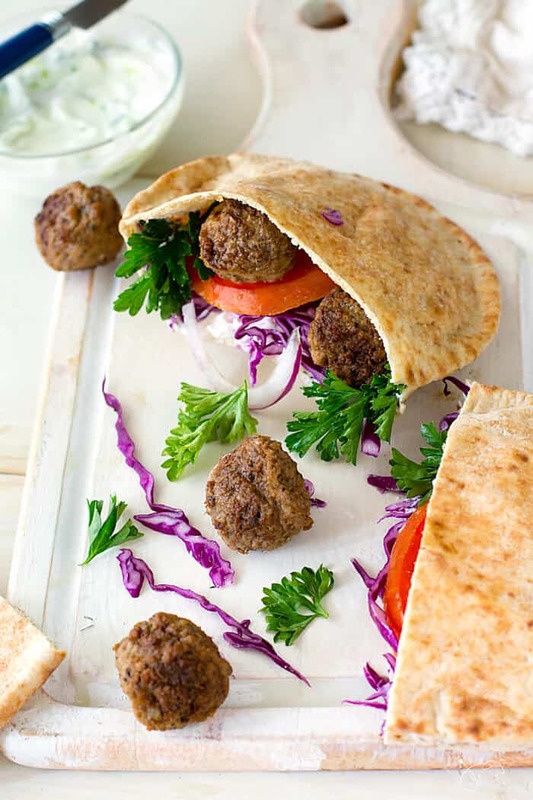 Freeze leftover meatballs or crumble and use in this Turkish hummus pita with lamb recipe. I first fell in love with GREEK CUISINE in Germany. Niko’s Grill was the first restaurant for us to try when we moved there. The restaurant’s whitewashed walls with vibrant blue-colored wooden windows and decorative columns reminiscent of the ancient Greek structures. I devoured everything that was served on a big platter, partly to make up for the lack of food during our civil war and partly because Greek cuisine is similar to Bosnian, thus a pure comfort to me. 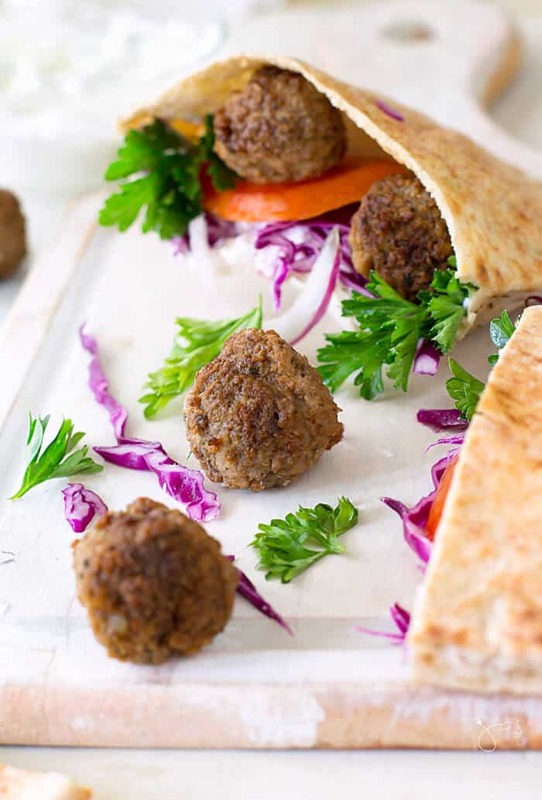 These meatballs almost taste like ćevapi, the Bosnian sausage links stuffed in our version of pita bread – a soft and chewy flatbread. The crust and the interior have two different textures whereas with pita it’s all basically the same. If you’ve never had ćevapi in lepinja (flatbread) before, you can make them easily at home. You’ll like those easy recipes in my cookbook. Greek lamb meatball pita sandwich is definitely hitting all the right spots. The pitas are stuffed with tomatoes, red cabbage, red onions, and wonderful Tzatziki sauce that will have everyone begging for seconds. There is nothing bland or boring about these pitas. 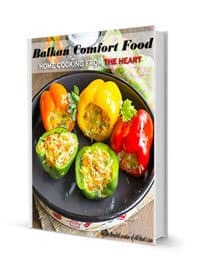 I promise, you will love this popular Mediterranean street food with lots of terrific flavors, so let’s get cooking! 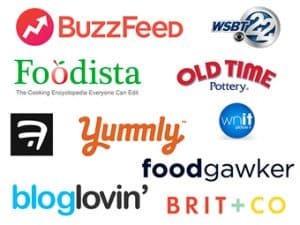 This post may contain some affiliate links for your convenience (which means if you make a purchase after clicking a link I will earn a small commission which helps keep my blog up and running but it won’t cost you a penny more)! Click here to read my full disclosure policy. Bake the meatballs on a baking sheet lined with parchment paper and bake them for 20 to 25 minutes at 400 degrees Fahrenheit or until done to your liking. 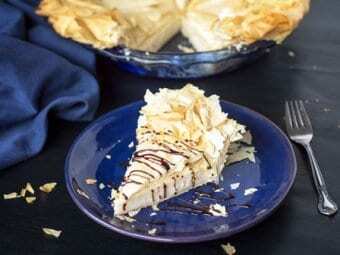 Refrigerate leftovers in an airtight container for up to 3 or 4 days. In a large mixing bowl, add all ingredients for the meatballs, except the oil. Blend it with your clean hands or using a wooden spoon. Don’t over mix. Shape the meatball mixture into 1-inch size balls. You should get around 24 meatballs. Heat the olive oil in a large skillet. Add the meatballs and sauté until brown and cooked through, about 10 minutes, turning them often so they hold their shape. Do in batches if necessary. In a small bowl, mix cabbage with salt, lemon juice, and oil. 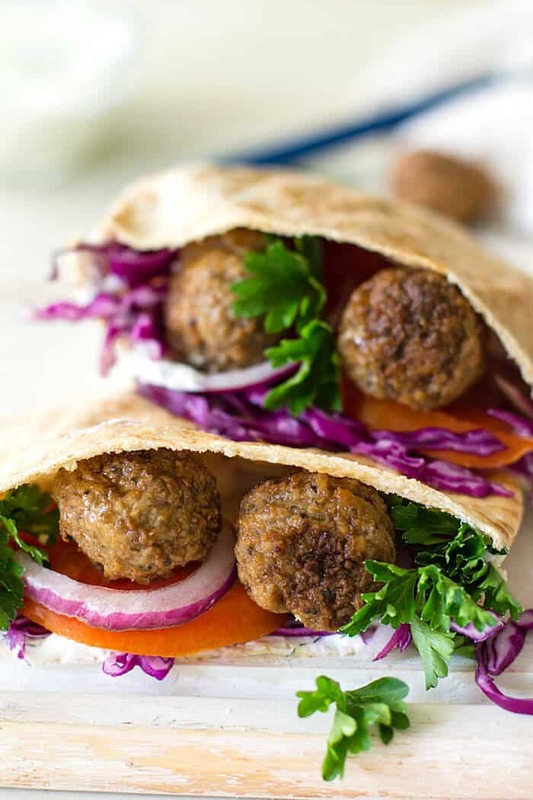 Divide tzatziki sauce among pita halves, top evenly with cabbage mixture, tomato and onion slices, meatballs, and parsley leaves if using. Enjoy! 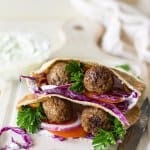 Flavorful and delicious, the Greek lamb meatball pita sandwich with Tzatziki sauce is easy to make and will have everyone begging for seconds. Featured on: Sew Historically, My Girlish Whims, Fiesta Friday, A Pinch of Joy, and Dizzy Busy and Hungry. Mogla bi ovakav sendvič svaki dan:) Perfektno! Jas you had me at Pita! I can eat almost anything in a pita. This version of the meatball looks very appetizing. I have some packages of ground lamb in my freezer… Okay, I think I know what one package is going to be made into!!! I love lamb and I love sandwiches!! Thanks for Sharing at the What’s for Dinner Party! My kids would love this one! Surprisingly, feta holds the meat together better than breadcrumbs (not to mention it tastes better too) 🙂 Thanks for stopping in, my friend! These pitas are fabulous. I love lamb anything. My husband doesn’t A while back I make koftas with half lamb, half beef, and my husband had no idea. It’s mean to trick him, but it’s not like he’s allergic to lamb… And I could definitely taste it. He just gets his mind set a certain way about certain foods. So I might try that again!